Each Aura 2gb mp4 player comes with a lithium-ion rechargeable battery, USB rechargeable, Boxed, comes with Headphones, CD software, USB cable and Headphones. A MP4 player is the next generation leap up from standard MP3 players. Not only do MP4 players play MP3 music, but they also playback video too. With an MP4 player you are able to watch videos that you download from your computer onto the player as well and watch them on the go wherever you may be. This is a perfect mobile entertainment machine with so many functions in such a small light weight portable machine. Because of the full colour screen you are able to also use the MP4 player as a photo viewer as well. The product has rechargeable batteries that are lithium-ion. This means you are able to charge whenever in the same manner as a mobile phone. This is a perfect mobile entertainment machine; you can play your favourite songs to keep you entertained on your travels or listen to it at home with the built in speakers. So much cheaper AND better than the leading mp3 player, Pod or not, Touch or not, this is THE best versatile product released! 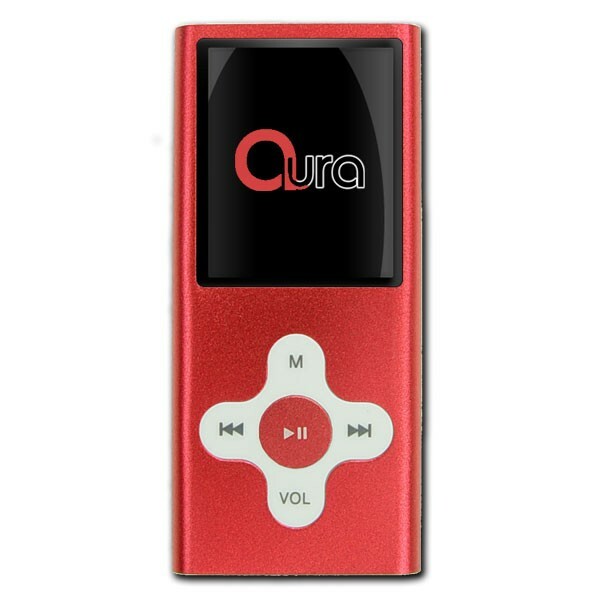 This Aura 2GB Portable MP3 is a great MP3 player. My daughter was so very excited that I bought this for her on her birthday. She said that it is worth every penny, and I agree with her. She also notice the price and said that the it was cheap, and now she is using it every day. This MP3 player is very good Qualitly, and I reccomed it to anyone who would like some advice on this product.